Former Moncton Wildcat captain and Saint Mary's Huskies agitator will be playing for the Green and Gold this fall. Chris Morehouse committed to the Tommies late in 2010 after playing a year and a half of pro hockey. Morehouse brings with him that "super pest" reputation of being great to play with and hated to play against. Never a big point producer, Chris adds that spark when you need a boost or scores the opportunistic goal when you least expect it. It would be easy to label Chris a real "Jekyll and Hyde" as he is noted to be one way on the ice and another off it. 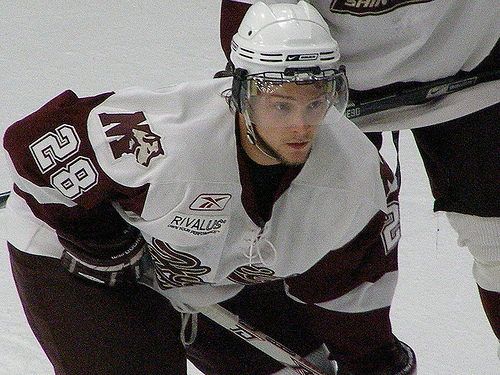 In 2008, while serving as Captain of the Moncton Wildcats, Morehouse was the QMJHL and Canadian Hockey Leagues Humanitarian of the Year. Chris' last pro game was on November 17, 2010 with the Tulsa Oilers of the CHL, therefore he will not be eligible to suit up with the Tommies until Saturday November 18, 2011. Welcome Chris.